"A tasty and tangy salsa that may be used for cooking or on top of Mexican-style foods! Adjust the amount of jalapeno to taste." In a food processor, place tomatillos, shallots, garlic, green chile peppers, cilantro, jalapeno pepper and salt. Using the pulse setting, coarsely chop. Cover and chill in the refrigerator until serving. pretty bland. was not a hit at my house. This was wonderful! The flavors were great and my husband and I ate it with tortilla chips in one night! Thanks! 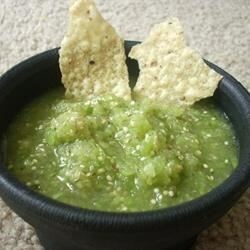 I love salsa, and this has just the right amount of kick for those who are heat lovers, AND those who are not. This salsa recipe is delicious. I used canned tomatillos and I also added chopped avocado to the mixture. My family loved it. I will use this recipe again.